The Golovkin vs. Canelo rematch took place this past weekend and fans are still talking about the action in the fight and are still debating the scorecards in what was an extremely close bout. When the decision was read, Canelo Alvarez won by scores of 115-113 twice and 114-114. With such a close fight and the scoring coming down to the last round, fans still feel there is unfinished business between the two fighters. 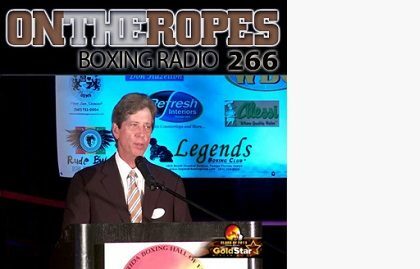 I recently had a chance to speak to the president of the International Boxing Organization, Ed Levine to discuss with him Gennady Golovkin’s defense of the IBO middleweight title and the scoring of the bout. Levine also talks about the current status of the IBO middleweight belt and when it could be defended again. Additionally, Ed shares his thoughts on the upcoming IBO heavyweight championship defense this weekend with Anthony Joshua facing Alexander Povetkin. Here is what Ed Levine had to say. Jenna J: The IBO middleweight belt was at stake for Gennady Golovkin this past weekend against Canelo Alvarez, what were your thoughts on the rematch? Ed Levine: My impression of that fight was that it was extremely close, very difficult to score. The three judges that were on that fight are extremely well regarded in the sport. I’ve reviewed the scorecard, it was a very interesting scorecard because the first eight rounds they agreed on every round. ON THE ROPESOTR #266.5 Ed Levine InterviewInterview with the president of the IBO, ED Levine. Steve Wiesfeld was in the minority only one time, Dave Moretti was in the minority only one time and Feldman was in the minority only two times. They saw the fight very similarly and it all came down to the last round. That was a difficult round to score as well. Feldman gave the round to Golovkin and the other two gave it to Alvarez, and that was interesting because that was the crucial round. If either Wiesfeld or Moretti gave that round to Golovkin, it would have been a majority draw and the titles would have been retained by Golovkin. It is amazing that one round and one judge could determine this outcome of this huge fight and all of the ramifications that follow it, as to the next fights. It’s an incredible statistic to me. Jenna J: I believe Canelo didn’t pay the sanctioning fees for the IBO belt, so is the IBO belt vacant now? Ed Levine: Yes it is. We did have conversations with Goldenboy promotions — cordial conversations — and we did not come to an agreement. Going into the fight, we knew and Golovkin knew that the IBO title was only at stake for Gennady Golovkin. Jenna J: If Gennady comes back in May as he plans, would it be fair to say that he would be fighting for that title in his next fight, given the way that he fought? Ed Levine: Absolutely. The rules are pretty simple, leading available contenders and there is no doubt in my mind that Gennady will be the number one ranked contender in the middleweight division, so he has priority. He’s certainly the number one contender in that division. Jenna J: When it comes to a possible third fight between Golovkin and Canelo, what do you think happens? Ed Levine: It’s the kind of fight where if Gennady had won this fight or if it was a draw, there would have been the same kinds of disputes from the Alvarez fans because this is the kind of fight where if you were really cheering for one fighter, you saw that fighter winning. It was that kind of close fight. Gennady is clearly getting older, he didn’t seem to lose much but he’s clearly getting older. A thirty year old Gennady might have performed much better than he did, and not to say that he didn’t deserve to win this fight because many people feel that he did. It could be a combination of age and gameplan, it is certainly possible. Jenna J: Anthony Joshua is defending his IBO Heavyweight title this weekend against Alexander Povetkin. What are your thoughts on this fight? Ed Levine: I see it as a very interesting fight. Povetkin has only one loss as you know, against Klitschko. They are both gold medal winners, they both can punch. Povetkin can punch, he can box, he’s been in with the best his entire career and in heavyweight boxing, even the best can sometimes get into trouble with one punch from a heavyweight. This is a dangerous fight for Anthony Joshua. I think with his youth and talent, he is deservedly the favorite but it’s a dangerous fight. 3 Responses to "Ed Levine: “If Golovkin had won this fight or if it was a draw, there would have been the same kinds of disputes from the Alvarez fans”"
I really wonder what will happen in the third fight. I think Golovkin showed signs of decline, so he might get stopped in the third fight. Canelo should have paid the fees for the IBO belt. It might be the only belt organization with any integrity. Triple G will win it again in his next fight.